Disclaimer: I do not, nor ever had, any level of secret clearance for any government. I have no connections to Snowden, the NSA, or any person or organization linked to them. From 2006 through 2012, I was the information security officer for a global financial services company, selling subscription based services to the largest companies in the world in every industry sector. Understandably, many of the larger corporate customers expressed a lot of concern over the confidentiality of their financial data when stored in our systems. Despite having numerous external audits and penetration tests (with reports available to these customers), many of the larger customers won additional concessions in the form of additional security controls, in exchange for their business. The U.S. PATRIOT Act was a tremendous stumbling block for many potential non-U.S. customers. They were concerned about the ability for law enforcement to serve secret subpoenas and obtain business records without their knowledge or consent. Our only argument was that we were not the source for original data, and that federal law enforcement would more likely go after original records, such as banking and telecommunications. Still, many non-U.S. companies elected not to do business with our U.S. based company because of PATRIOT. Revelations of Prism and XKeyscore represent U.S. law enforcement and spy agencies taking a gigantic leap beyond PATRIOT. With PATRIOT (as I understand it — my former employer was never, to my knowledge, served with a National Security Letter), a judge was required to sign or approve the national security letter on behalf of the federal law enforcement agency that wished to obtain information. But with Prism and XKeyscore, U.S. federal law enforcement and other agencies have unilaterally obtained – and apparently continuously obtain – many forms of electronic records, without the consent of anyone. Prism and XKeyscore, in my belief, will prove to be extremely harmful to U.S. based electronic services providers at every level: Software as a Service (SaaS), Platform as a Service (PaaS), Infrastructure as a Service (IaaS), and virtually all other forms of electronic services that store, transmit, or process electronic information. With PATRIOT, the mere prospect of law enforcement obtaining information in special, limited circumstances was enough to scare away many potential customers. With XKeyScore and Prism, law enforcement continuously obtains much of this same information. Thus, the probability of law enforcement (and other agencies) obtaining sensitive information increases from longshot to near absolute certainty. This has got to be bad for U.S. based businesses in nearly every sector that provides services to customers worldwide. This entry was posted in Law Enforcement, Opinion, Privacy, threats and tagged cloud, IAAS, NSA, PaaS, PATRIOT, Prism, SAAS, Snowden, XKeyscore on August 1, 2013 by peterhgregory. The U.S. PATRIOT Act has a lot of non-U.S. companies wondering whether it is a sound practice to store data in a U.S. based cloud services organization. The concern is this: the cloud services provider may be obligated to turn over stored data on receipt of a National Security Letter, which is essentially a subpoena with a gag order. But what if the customer is the legal owner of the data, and not the cloud services provider? If legal contracts between the cloud services provider and its customers define customers as the owner of stored data, what happens when the cloud services provider receives a National Security Letter asking for that data? Can the provider say, “sorry – this is not our data, you need to ask the owner for it”? I could see this going both ways. Using the precedent of wiretapping, the law enforcement agency issuing the subpoena might argue that data ownership is irrelevant. While we’re on the topic of PATRIOT… I often wonder about non-U.S. companies’ concern about it. Rationale I sometimes hear is that storing data in the U.S. is riskier because of PATRIOT. Let me assert this: in the interest of national security, any nation’s law enforcement or intelligence agencies are going to search and sieze data as needed, whether there are laws on the books or not. The fact that the U.S. has its PATRIOT Act only means that the U.S. is being more transparent about a practice that we all know is pervasive around the world. Taking this argument further, you could argue that storing data in the U.S. is safer, because at least the U.S. has laws governing the use of search and seizure in the name of national security. In countries without such laws, what will limit the reach of law enforcement and intelligence agencies? Finally, I want to say that I am not expressing an opinion about PATRIOT – whether I agree with it or not. It is simply a fact to be dealt with. The Patriot Act and your data: Should you ask cloud providers about protection? – InfoWorld article, January 2012. Patriot Act Threatens American Cloud Computing – Wall Street Cheat Sheet, January 2012. This entry was posted in Law Enforcement, Risks and tagged cloud services, LinkedIn, national security letter, PATRIOT, subpoena on February 18, 2012 by peterhgregory. 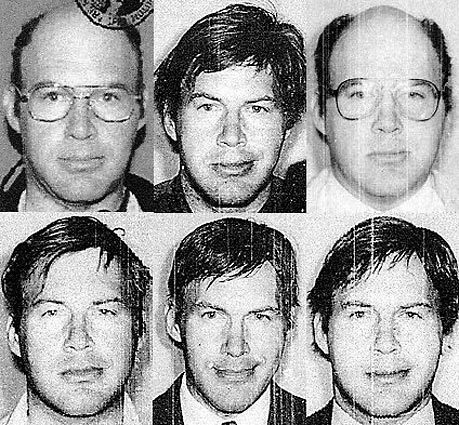 The Federal Bureau of Investigation has allegedly identified the “mystery man” who has as many as 32 aliases. He is identified as Scott Andrew Shain. Fake fingerprints, multiple aliases, in FBI custody; name=?? This entry was posted in identity theft, Law Enforcement and tagged FBI, fraud, identity theft, scott andrew shain, seattle on March 24, 2008 by peterhgregory. The FBI has released several more photos of the career identity thief but they still don’t know who he is. The FBI is asking anyone who knows this person to call them at 206-622-0460. Seattle Times article: Mastermind or troubled mind? This entry was posted in identity theft, Law Enforcement and tagged Dwayne Spill, FBI, identity theft, Robert Allan Loew, Robert Allen Lowe, William Everett Gee on March 22, 2008 by peterhgregory.